Some surprising roster moves this morning as the Stars dropped goaltender Nick Schmit from the roster, and traded for goaltender Shane Starrett ('94) from the Sioux Falls Stampede. Lincoln traded a conditional fifth round USHL entry pick (2014) for the rights to Starrett, who has committed to Boston University. Everything I've read online indicates Starrett will attend BU in the fall of 2014. Starrett is a tall, lanky goaltender, coming in at 6'5", 180 pounds. He is originally from Bellingham, MA. Last season, Starrett emerged as one of the top goaltenders on the east coast after putting up a 24-12-4 record with a 1.90 goals-against average and a .915 save percentage for South Kent School, which is located in South Kent, CT.
Starrett received a lot of attention from NHL scouts, and was considered a possible late round pick in the 2013 NHL Entry Draft. However, he was not selected. Click here and here to read articles about Starrett. 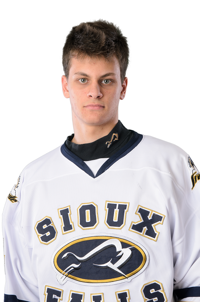 This past spring, Starrett was drafted by the Sioux Falls Stampede in the fourth round of the 2013 USHL Entry Draft. He participated in parts of 5 preseason games for the Stampede this season, and posted a 2-0-1 record with a 4.90 goals against average and a .829 save percentage. In the regular season, Starrett only played 35 seconds in the Stampede's 2-0 loss against the Omaha Lancers. Starrett became expendable by the Stampede after the team acquired goaltender Arthur Brey, who was surprisingly let go by the Dubuque Fighting Saints at the start of the regular season. Sioux Falls returned goaltender David Jacobsen from last season as well. Best of luck to Nick Schmit wherever he lands. I would assume he will play for a NAHL team this season. I'm just an idiot with a blog, but I'm not sure Schmit really got a fair shake here in Lincoln. He started one game and was pulled after giving up three goals in the first period against Waterloo on 10/11/13. In that particular contest against the Blackhawks, he didn't get much help from his teammates. The Stars pretty much laid an egg that game, so I don't believe it was a fair representation of Schmit's skills and abilities. This is just my worthless opinion, but this trade makes very little sense to me. There's no question that Bitzer is the #1 goaltender for the Stars this season. He's arguably the best goaltender in the USHL, and should be starting 85-90% of the games for Lincoln. Trading another draft pick away for a highly touted (but USHL unproven) goaltender who is gone after this season doesn't seem very wise to me. Now, if Starrett has been pushed back by BU to the fall of 2015, then the trade makes great sense. However, as I stated above, everything I've read online indicates Starrett is attending BU in the fall of 2014. Enough of my inane ramblings. Your thoughts on the trade? Agree 100% with you on this. That seems a pretty steep price to pay for a backup. I'd like to think that there is a good reason for the trade, but it's a head-scratcher for sure. Now just my .02 cents but I'd like to see us keep those draft picks and be able to build something instead of this constant trading of players in and out and then not having draft picks the following year. It seems like Chad (and Steve before him) had a pretty good track record of drafting players and then letting the season play out -- sure they made a trade every now and then, but that was mostly later in the year to fill an obvious need to make the team better for a stretch run. Last year was a good example of that; getting Riley and Phil, but those were moves later in the season after you had time to see what the team was. We are only 7 games in now. Just my .02 on the topic. The roster is a revolving door already. Brings back memories of the 2009-10 season. Mayeb he's releasing him so he has an opportunity to get playing time somewhere else and possibly land a scholarship. Just my .02 cents. We're going to turn it around; black and blue hockey is what we are!!! Thats great if the coaches are allowing him to get more playing time somewhere else. But if thats the case why did Schmit come here? He knew coming in he wasn't going to get a lot of ice time behind Bitzer, especially on such a young inexperienced team. Bitzer cant afford not to play in most of the games if Lincoln wants to be a playoff team. I guess I am confused also. Why not just bring up a NAHL goaltender that way you dont waste a draft pick on a player who isnt going to play much here and is going to Boston next fall. Anon's point about bringing up a G from the affiliate list is valid. It's not making any sense, unless its an issue outside the rink? Do you work a goalie for 50+ games in the USHL? I'm just asking. Another question: Is there a suspicion Bitzer is going somewhere? Can Bemidji call him up?